You’ve decided to take better care of yourself and have started a workout regimen. Good for you! But after a few days, you’ve noticed that you’re starting to experience pain in the heel of your foot. It’s not surprising. Your feet are suddenly undergoing additional stress during your workout. Feet contain a quarter of the entire body’s bones, nearly three dozen joints and more than 100 tendons, ligaments and muscles. High-impact exercise can create forces on your feet that are up to 10 times your body weight. Many different conditions can cause heel pain while exercising, including Achilles tendinitis and plantar fasciitis. Both are common but complicated foot injuries. We’re going to focus today on your plantar fascia and leave your Achilles for another time. Plantar fasciitis is a fairly easy problem to fix… if you act early. The longer you wait, the worse it gets and the longer it will take to heal. Don’t wait to treat this condition. At the first sign of heel pain while exercising, contact the specialists at Martin Foot and Ankle. The plantar fascia is a band of connective tissue that runs along the bottom of your foot connecting your heel to the base of your toes. It’s a kind of shock absorber supporting the arch in your foot. Starting to exercise can cause new stresses on the fascia. And tiny tears can occur resulting in irritation, inflammation and pain. The pain might feel like a stabbing sensation in the heel or arch of the foot, or it might feel more like a deep ache or throbbing. Most people feel this pain when getting out of bed first thing in the morning. At night, the fascia is contracted in a pointed foot position in an attempt to relieve the stress and to heal itself. But when you step out of bed in the morning, the sudden strain can occur all over again. Sometimes the pain lessens as the foot gets warmed up and moving. But that doesn’t mean the problem has gone away. We know you like exercising, but this might also be a time for a little break. Your feet need some time off from whatever is causing the issue. We suggest you cut back a bit and let your feet rest. But we can also offer a few exercises specifically for your heel pain. Stretching and exercising the tight tissues of the fascia can help loosen them, relieving some of the discomfort. Calf Stretch – Stand with your palms flat on a wall at chest level. Set one foot back several inches and keep that knee locked straight. Bend your front knee so you lunge toward the wall without lifting your heels. Hold the stretch for ten seconds, then relax. Repeat the exercise with both front and back knees bent. Towel Stretch – Sit with your feet straight in front of you. Loop a towel around the ball of one foot. Pull back on the ends of the towel so your foot flexes. Hold it for ten seconds, then relax and repeat. Water Bottle Exercise – Take a cold or frozen water bottle and set it on the floor. Roll it back and forth under your sole, pressing down gently to massage the bottom of your foot. This can help decrease inflammation and swelling. Item Pick-Ups – Lay out small items in front of you, like marbles, pencils, or pebbles. Using just your toes, pick them up one-by-one and put them in a bowl beside you. Each of these exercises helps loosen tight tissues and condition your feet to function properly. Used along with other conservative treatments for heel pain, these exercises and stretches can significantly reduce your discomfort from plantar fasciitis. Another thing to consider is that it might be time for a new pair of shoes. Comfortable shoes with arch support are a great choice for reducing heel pain. Properly fitted supportive shoes will align your feet to their natural position and evenly distribute your weight across your feet, reducing the stress on your plantar fascia. Please visit therightshoe.net to see the styles and options we have available. 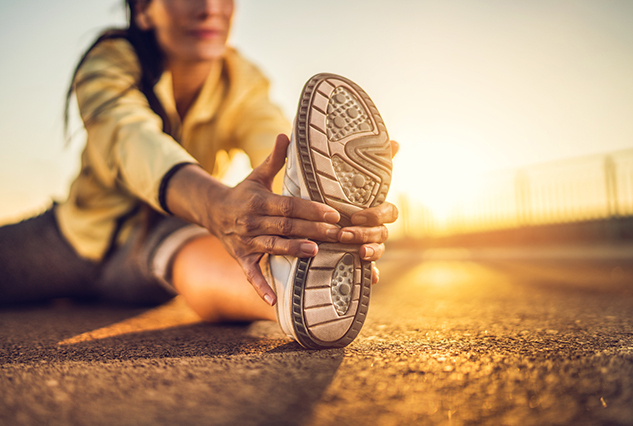 If you’d like help with your uncomfortable heels, or are not sure how to perform these exercises, contact Martin Foot and Ankle for an appointment. You can reach our offices in Hanover, Lancaster, Lititz, York and West York by calling (717) 757-3537 or (844) 899-6961 or using our website contact form. Our team of podiatrists will carefully examine your feet to diagnose your condition. We may need to use multiple tests and even diagnostic images to rule out other possible issues in your heels. Once we have confirmed the cause of your discomfort and the contributing factors, we can begin treating the problem.